Earlier this week I posted a review of the Mac window tiling app Magnet which is currently on sale in the Mac App Store for €0.99. @DriesDeRoeck replied on Twitter to point me nice free and open source alternative – Spectacle. While Spectacle is very similar to Magnet in many ways, the two apps do have some notable differences. With Magnet you effectively get three modes of operation – a drop-down menu in the menubar, keyboard shortcuts, and hot edges on the screen. 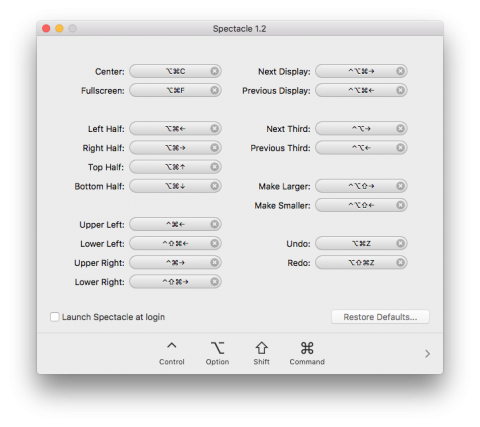 Spectacle only has two modes of operation – a drop-down menu in the menubar, and keyboard shortcuts. With Magnet you can’t remove the menubar icon and make the app totally invisible, but with Spectacle you can. Spectacle has a few nice little features that Magnet doesn’t, for example, it has an option to disable the app for an hour, or, for the current app, and it has options for making windows bigger and smaller without moving them. On the other hand, Magnet can remember where widows were before it altered their size and position, and restore them to that position later with a keystroke, which Spectacle can’t. For easy comparison, I’m including equivalent screenshots to those I included in my Magnet review – one of the drop-down menu in the menubar, and one of the configuration window. The bottom line as I see it is that if, like me, you don’t want hot zones because they interfere with the Spaces feature in macOS, then Spectacle is probably the better option for you.